From version 5.0 onward, Marvel is part of X-Pack. 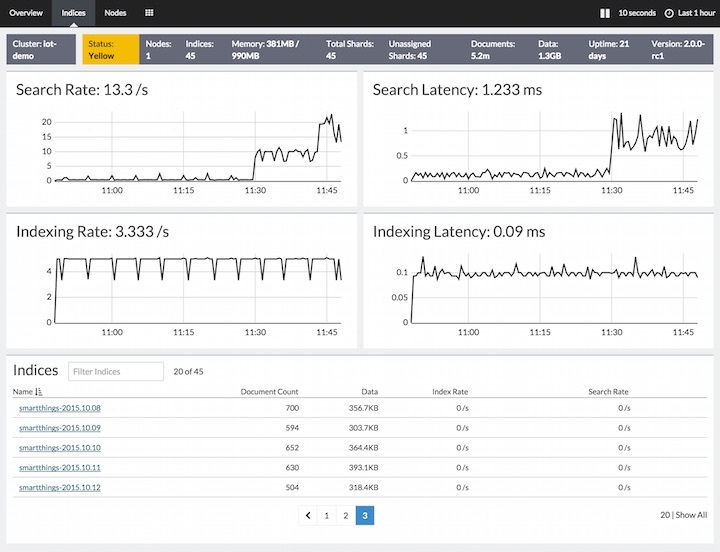 For more information, see Monitoring Elasticsearch and Kibana in the X-Pack Reference. 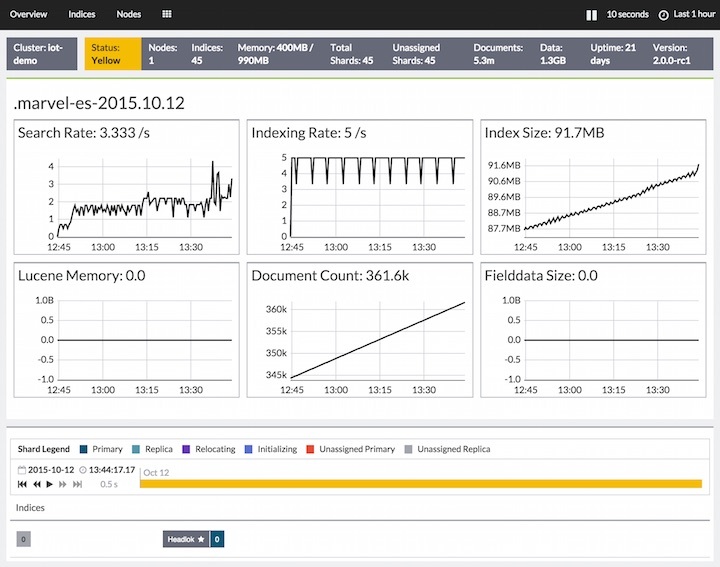 Marvel enables you to easily monitor Elasticsearch through Kibana. 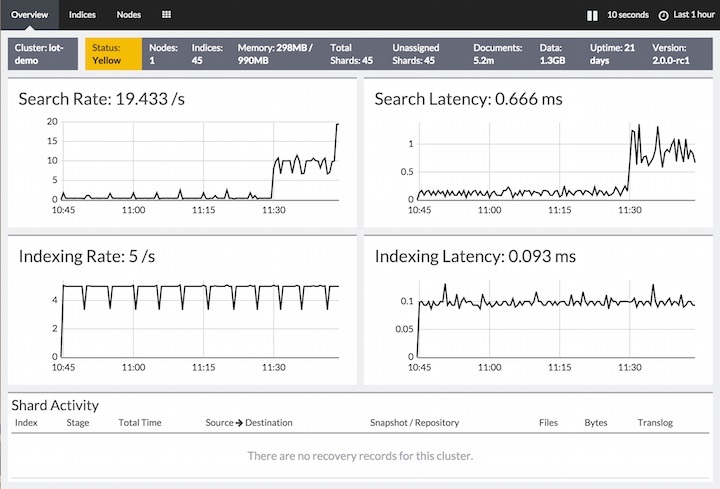 You can view your cluster’s health and performance in real time as well as analyze past cluster, index, and node metrics. This guide describes how to install, manage, and use Marvel. Marvel consists of two components: a Marvel agent that you install on on each node in your cluster, and a Marvel application you install in Kibana. The Marvel agent collects and indexes metrics from Elasticsearch and you visualize the data through the Marvel dashboards in Kibana. The agent can index data on the same cluster, or send it to an external monitoring cluster. When you open the Marvel app in Kibana, you see a list of the clusters that you are monitoring. To view the key metrics that indicate the overall health of a cluster, click the cluster name in the cluster list. Anything that needs your attention is highlighted in yellow or red. The panel at the top of the page shows the current cluster stats, the charts show the search and indexing performance over time, and the table at the bottom shows information about any shards that are being recovered. 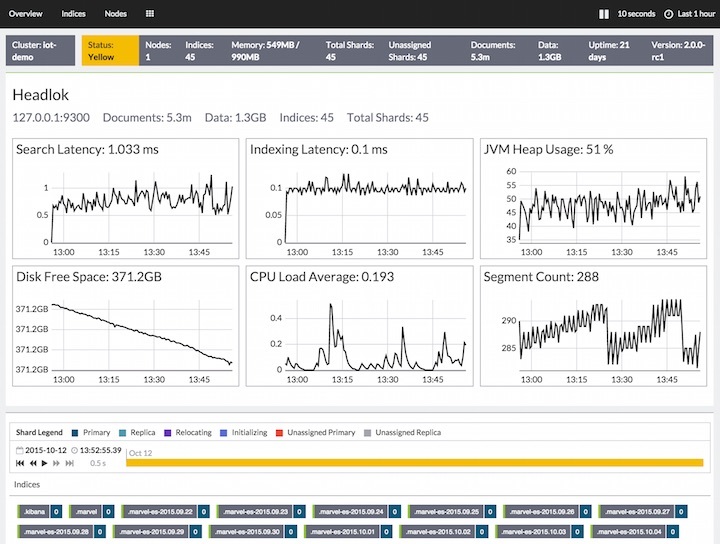 From there, you can dive into detailed metrics for particular nodes and indices. To view index metrics, click the Indices tab in the top menu bar. The Indices page shows the same overall index and search metrics as the Overview page and a table of your indices. From there, you can view data for a particular index or group of indices. To drill down into the data for a particular index, click its name in the Indices table. To view node metrics, click the Nodes tab in the top menu bar. The Nodes page shows the status of each node in your cluster. Click the name of a node to view its node stats over time. Getting Started steps through how to install and start using Marvel to monitor Elasticsearch. Head over to our Marvel Discussion Forum to share you experience, questions, and suggestions.